UK spinning wheels - 20th C handmade spinning wheels from England, Ireland, Scotland and Wales. This website is a work in progress. Scroll the down this page to find the list of spinning wheel makers. The aim of this website is to provide a resource for learning about spinning wheels made in the UK during the 20th C, with some reference to older traditions and to wheels made elsewhere that turn up in the British Isles. During the first half of the 20th C up until the 1970s most new spinning wheels for British handspinners were imported from Scandinavia by suppliers including: Dryad, F.A Goodlife, Frank Herring & Sons, The London School of Weaving. Later, in the 1970s there was generally more interest in traditional crafts and during this period many woodworkers took up making spinning wheels to supply the new demand from those learning to spin yarns from wool, flax and other fibre sources. Intially many were copies of Scandinavian wheels but traditional styles of Scottish, English and Welsh wheels were revived and became popular together with new designs. Also from 1970s onwards spinning wheels were being imported from other countries - including Scandinavia and new Zealand. This website is a work in progress If you are able to assist with information about British spinning wheels and their makers please get in touch with website author Dorothy Lumb via the YarnMaker website. This page has some basic information and links to help people who would like to learn how to use a spinning wheel. On the page linked to here you will find links for intermediate/advanced spinning techniques and a Spinner's Record Card, designed by Jill Shepherd for your personal use. there is a team working on a website for spinning wheels made in the USA, when it is online I will post a link here. Link to the last spinning wheel maker in Ireland, Johnny Shiels, who makes wheels of a style traditional to Ireland but which has also been copied by makers in the Lake District and Isle of Man. I am sure there are also many more spinning wheel makers in England, Wales, Scotland and Northern Ireland working in the 20th C who are not yet in this list, as well as incomplete entries, and I welcome any information that you are willing to share. In due course I hope to set up extra pages for individual makers with more images and detail of the wheels they made. At the bottom of this page a second list has some photos and/or details of wheels for which we don't know the maker, please take a look and see if you can help with identification. Click here for a short cut to the mystery wheels section. AYLWARD - Spinning wheel by this maker pictured in 1981 Dryad Leaflet 532 Spinning on the Wheel. It has a solid disk for the drive wheel, a single treadle a leaf-spring for the scotch tension brake above the flyer and metal flyer arms. ARDICI of Wooten Bassett. Maker of a Scandinavian style wheel that has a flat double-table with three legs, single treadle, large diameter drive wheel. BARBICAN CRAFTMANSHIP model: QUANTOCK. At this stage all I have is written description from an ebay sale. The wheel had a plywood drive wheel with both a weight in it and a hole through. It has an integral carrying handle, is 70cm tall, drive wheel 33cm. There was a separate lazy kate to go with it, and the maker was Pete Beard of Plymouth. If you know more, please get in touch. BARKER - Mr Barker is known to have made many wheels at his workshop in Felin Cochwillan, Taly Bont, Bangor, Wales, probably from mid 1970s to late 1980s by which time he was advanced in years. More information about this maker and photographs would be appreciated, if anyone reading this can help. BARTON CRAFTS e-spinner. Based in Radlett, Hertfordshire. Made an electric spinner from hardwood and advertised them in The Weavers Journal n 136, Autumn 1985. Described by one owner of a machine over 30 years old and still in use as "fab, very smooth and easy to control because of the foot pedal. It's really nice not having to use your hand [to access the controls] when you want to stop spinning." BILL GAYLOR - a spinner and wheel builder, probably based in Buckinghamshire (was a member of the Bucks Guild of Weavers, Spinners and Dyers). Bill made spindles but is also known to have built at least two spinning wheels, an upright and a type of pendulum wheel based on a patent granted to Canadian designer Thomas Wright in 1871. Pendulum wheels are like a great wheel with the spindle on an arm, balanced by a weight, which moves away from the spinner as the spinner leans on a treadle enabling a longer length of yarn to be spun before winding on to the spindle. The speed of the spindle is increased by an simple gear mechanism. Thomas Wright's design is compact with a smaller drive wheel than other pendulum type wheels (around 110cm) and the spindle on an arm that pivots near the floor. BILL STABLES (flax wheel) Of Cumbria, made a wheel in the style of the Irish Flax wheel. This style of spinning wheel became popular in Cumbria following John Ruskin establishing a local linen industry; the same style is also found in the Isle of Man. See entry for Jimmy Shiels for a typical Irish Flax wheel. The design is believed to have come to Ireland from Holland. CROWDYS WOOD PRODUCTS Based in Clanfield, Oxford, where they made and sold wheels from their own showroom. Advertised in The Weavers Journal no.116 Winter 1980: Spinning wheels, upright, horizontal and sloping bed. Practical and attractive designs in variety of timbers. Illustrations and list will be gladly sent on request. We also supply carders, drop spindles and skein winders (niddy-noddy). Visitors are most welcome to inspect and try wheels at our workshop and showroom (open Monday to Saturday 9am to 6pm). Their large sloping bed wheel has a split table and a 27" drive wheel, it was made in different woods possibly including yew, elm and beech. DAVID BRYANT various types of spinning wheel made by the British expert on antique spinning wheels, plans for several of his designs were published in a book and are still available on his website www.craftdesgins.co.uk. Wheels actually made by David Bryant bear his plaque. Design sold include traditional types of SHETLAND, ENGLISH and NORWEGIAN wheels as well as an UPRIGHT SPINNING WHEEL, CONNECTICUT CHAIR WHEEL, ARKWRIGHT STYLE, SAMUEL CROMPTON STYLE, SPINDLE WHEEL, GREAT WHEEL, SLOPING SPINNING WHEEL. DEVON SPINNING WHEELS Devon Spinning Wheels were located in Newton Abbot, Devon and advertised in The Journal no. 167, September 1993. Theywere offering two designs: ELEANOR, an upright spinning wheel based on a traditional design with "maintenance free longlife bearings", and MARGUERITTE, a sloping bed spinning wheel based on a traditional design with "maintenance free longlife bearings". Upright wheel with treadle that folds up, four legs of which the front two fold backwards. The flyer arms are attached to flyer whorl, orifice a wire loop on the end of the flyer arm, bobbin held on behind a nylon nut on the flyer shaft. The wood is mahogany coloured, apart from the bobbin which is a light colour. Very small drive wheel, much smaller than the flyer, driven by a leather belt. Makers name stamped into the wood on the rear of the upright at the back. Brass carrying handle fitted at the same point as the signature. Believed to date from 1980s (based on date of purchase given by an Ebay seller). A second wheel spotted on Ebay in 2016 was made according to a commonly used design published in The Woodworker magazine in the 1970s, which is the same design developed into the "Lonsdale" by James Williamson and the "MacDonald" by Martin Reeves. D P POLSON - the Heritage Centre, Unst, Shetland, has two spinning wheels made by D P Poulson of West Yell, Shetland. One is a small, saxony-style wheel with a sloping bed and three legs, made in 2011. The other is an upright wheel. DOUGLAS ANDREW LTD Known as a builder of looms for handweavers, but also made at least two types of spinning wheel. One was small three legged upright spinning wheel, makers name stamped into the rim of the drive wheel (seen on ebay) another was a Scandinavian style of wheel with a flat table and large drive wheel, as shown in the photo. DRYAD - importers of the Norwegian wheels made by the Gylland family from around 1931 until the outbreak of the Second World War (1939) when it was no longer possible to trade with Norway. From then onwards Dryad commissioned a copy of the Gylland wheel made in England, first in pitch pine and later from beech wood. This was superceded later, and from the 1964 catalogue through to 1969 (possibly others, my set is incomplete) they were importing a different double-table wheel, probably made by Anders Olsen Wollan, the last known wheelmaker in Gylland who was making wheels between 1963 and 1983. By 1981 Dryad were stocking instead wheels made by Bernard AYLWARD and also HALDANE. You can discover the story of Gylland spinning wheels and the Dryad copies in The Spinning Wheels Sleuth issues #101 and #102. EASY-SPIN - made by Mr Jon Starkey of Midsomer, Norton, Avon, who was an engineer and is believed to have made many spinning wheels. An advert in The Weavers Journal, 121 Spring 1982 (but not other editions) said "British made upright type, hand crafted in Iroko, spindle to floor type to suit your requirements. Adjustable spindle speed for thick or thin yarn. No threading required. 3 large capacity quick change bobbins." FRANK HERRING AND SONS Imported scandinavian wheels and later wheels from New Zealand, often sold with a Frank Herring and Sons name plate added, later moved into selling wheels they designed and commissioned. The wheels made in Britain were ALPHA folding wheel with an aluminum flyer, frame and drive wheel of which seems to have been a single batch made and on sale in 1987-9; the HERRING CASTLE WHEEL, made in 1997; the HERRING WHEEL which had a bent plywood frame of which around 1,000 were sold between 1983 and 2015. The Herring wheel won an award from the London Design Centre for aesthic design. Batches of the Herring wheel may also bear the maker's name, see entries below for HERRING GORDON and SHAPWICK BLAISE HERRING. Note: parts for the Herring are still available from Frank Herring & Sons. Left: the Herring Wheel (bent plywood frame), right, Herring Alpha. The Alpha treadle folds up for transport. GORDON CLARKE - of Spinners Gallery, Market Place, Marazion, Penzance. Listed as a spinning wheel maker by Mabel Ross in her The Essentials of Yarn Design for Handspinners (1983), see WILLIAM GORDON CLARKE listing below. GORDON GENTLES - of The Station, Strathpeffer, Dingwall, Ross-shire, Scotland. A "Hebridean Spinning Wheel" by this maker, which looks typical of the traditional wheels used in the Hebridean islands, is pictured in Mabel Ross's Encyclopedia of Handspinning page 198. A correspondent tells me she has two wheels made by Gordon Gentles, a small Shetland-type made in 1982 and a large Saxony type, made in 1985. She adds "He must have come to the attention of Mabel Ross around that time because she listed him in her appendix, "Spinning Wheel and Equipment Suppliers", (p119), The Essentials of Yarn Design for Handspinners. I believe he had a long list of orders resulting from this." GRANVILLE SWANNEY of Orkney. Maker of the Traditional Orkney spinning wheels in both upright "spinney" and sloping bed forms. The sloping bed style was an older tradition on Orkney, upright spinney wheels were introduced from the Shetland Isles at the end of the 19th century. Granville's spinning wheels have the three distinctive characteristics common to Orkney wheels: chamfered treadle, dumbbell-shaped drive wheel spokes and two drive bands on the drive wheel, one driving the flyer and the other the bobbin. HALDANE, of Fife, Scotland. Special page dedicated to the Haldane spinning wheels here. The model names are HARRIS, HEBRIDEAN, LEWIS, ORKNEY, SHETLAND. Photos below left to right: Harris, Shetland mark 1, Hebridean, Lewis with rectangular table, Lewis with curved table, Orkney. HAMISH POLSON of the isle of Yell, Shetland. Late 20th C (and 21st C) maker of upright and saxony type Shetland spinning wheels, believed to have made "hundreds". HARRY POUNCEY (various designs, possibly many different ones), lived in Moniaive, Dumfries, Scotland, a retired Rolls Royce enigneer, Harry was making spinning wheels in the 1970s and 1980s. A founder member of the Dumfries Guild of Weavers, Spinners and Dyers. Harry signed his spinning wheels on the underside of the treadle. Designs were: Black Forrest; Two Column Black Forrest; Austrian; Craigdarroch; Norwegian; Pennefilian (based on a Finnish flax wheel). A skein winder and lazy kate were optional additions to all the wheels and he also made a free standing skein winder, stool, chair, box type lazy-kate. When he stopped making wheels he trained Neville Smith who took over from him and made wheels up until 1991. Neville also signed the wheels that he made on the underside of the treadle. Below: first two photos are of the same wheel, we know this was made by Harry Pouncey from his signature but do not have the model name, it is possibly a simplified verison of his Black Forest wheel; the next wheel is the smallest one made by Harry, called "The Austrian", with a 15" drive wheel; fourth picture from left is the Craigdarroch (this one pictured has the optional lazy-kate) based on a Tyrolean design. HERRING and HERRING ALPHA - see above entry for FRANK HERRING AND SONS. HERRING GORDON WHEEL - made by WILLIAM GORDON CLARKE. Possibly the first version of the well known bent plywood Frank Herring & Sons spinning wheel, pictured in Mabel Ross's Encyclopedia of Handspinning 1988. Later made by Shapwick Blaise for Frank Herring & Sons; and other batches were made by other makers. HIGHAM A couple of reports have been received of spinning wheels signed "Higham" with the Bury-St Edmunds phone number 810857. If you have any information about this maker please get in touch. HOPKINS - Mr Hopkins of Fillongley, Warwickshire made spinning wheels which he sold at local craft fairs in around 1988-90. The one pictured below is made from London Plane wood. Also known to have made curved-back handcarders. ICENI WHEELS: two different models of spinning wheel The Iceni and the Iceni Trinovante. They were made by two men working in Ipswich in the late 1970s/1980s using kiln dried beech wood. The wheels were sold by a local spinning tutor Eileen Ringwood of Diss. The ICENI is an unusual design of upright spinning wheel with a triangular frame, an 18" diameter drive wheel, ratios 1:6 and 1:9. Also the ICENI TRINOVANTE. J.A.N. BURRA - Dingle Hill Products, Mid Cowden, Comrie, Perthshire, Of Perthshire. Made an electric spinner and also a wheel described by Mabel Ross in her Encyclopedia of Handspinning 1988 as "Shetland style". In her book The Essentials of Yarn Design for Handspinners she notes "also makes electric spinner". JACK GREENE Maker of great wheels, mostly sold to re-enactors. JAMES WILLIAMSON - see Timbertops. JIM HENNEQUEN - maker of a "fine 25 1/2" diameter ash wheel" photographed on p.19 of Jill Goodwin's book A Dyer's Manual, first publihsed in 1982. The style of the wheel is saxony with a sloping table, large drive wheel and tall maidens. One was offered for sale on ebay in Nov 2016 I discovered the identity too late to contact the seller - maybe someone reading this owns one and can help with a photo? Two unusual details: the spokes of the wheel are plain with no shaping, the wheel supports are not turned, they are wide and flat. JOHN BAIN believed to be a Scottish wheel maker, the name is typical of Orkney/Shetland/Aberdeen areas and the wheel photographed turned up in Aberdeen in 2012. It is a delicately proportioned upright wheel, no ornate turnings, and relatively tall. (Height unknown, but the purchaser in 2012 found it too tall for comfort.) It is reported from observation of the upright wheel supports that it is possible that this wheel originally had a distaff. JOHN BRIGHTWELL made spinning wheels and other items at his workshop at West Hatch, near Taunton, Somerset. He is a member of the Dorset Guild of Master Craftsmen. Wheels made include the BIG JOHN (below, left) which is Scandinavian in style with a large 24" drive wheel.diameter drive wheel and a flat bed and was offered in softwood, light Oak and dark Oak with the option of a distaff. His smaller saxony spinning wheel (2nd from left) with a 16" diameter drive wheel was offered in dark oak, light Oak, Utile (Mahogany) and natural Ash. He also made the small upright wheel (3rd from left) and other designs. Other items made include spinning chairs in light and dark Oak and swearie boxes (one of these is seen with the upright wheel below). JOHN MANNING of St Albans, Hertfordshire. Not much known about this maker other than an advert in Weavers Journal no. 118, Summer 1981, saying "Horizontal Spinning Wheel for £34. I make three different models and can supply them with lazy kates, hand spindles and carders to order. Send s.a.e. for leaflet/prices." JOHN SEYMOUR Wheels sold through Little London Spinners of Romsey, Hampshire. John Seymour was making upright spinning wheels in 1983 and also made a saxony wheel with beautiful marquetry inlay decoration, people who ordered new wheels were offered a choice of different inlay designs. Matching accesories include spinning chair and lazy kate. The saxony wheel pictured is made in mahogany with yew inlay. KEITH AND LOIS BERNEY of Lewes, East Sussex. Makers of the "Southover" wheel, a lightweight upright spinning wheel, which incorporated special inovative features which they protected under GB patent GB2047281A. These included a weight on the end of the flyer arm to give added momentum to the flyer, quote from the patent application: "To the rear of the bearing a stretchable single drive band extends over differing spindle pulley sizes and together with a flywheel produces variable spinning speed with unaffected treadle or drive momentum." ie the spinner can move the drive band onto a different flyer whorl (or spindle pulley) to change the speed the flyer is going around without having to treadle any faster or slower. There was also an easy to thread "eye" rather than orifice on the flyer and a "slidable friction-held thread guide". The patent was filed in 1979 and granted in 1980. LEADBETTER (copy of Canadian 'production' type wheel) Large Ash and Walnut spinning wheels with 27 3/8" (96cm) diameter drive wheel and unusual system for tensioning the drive band. He made a copy of a Canadian Production Wheel (possibly by Guy Ouellet who used the same tension system and treadle shape) but the original wheel did not work well and Mr Leadbetter improved the design. Wheels were sold via a shop (or couple of shops?). Writing under the table of my wheel says "GJL780 Elland Wharfe 0043a" possibly indicating that it was made in July 1980. Link here for more information and pictures. LISLECRAFT - initially Fleet, Hampshire (1980); had moved to the Isle of Wight by 1982. Advertised in the inc. no. 117, Spring 1981. Collapsible spinning wheels and chairs made from elm, assembled without screws. Advert says that special features of the wheel were patent protected and design registration to the chair is pending. "Hand-made, these wheels and chairs require no tools for assembly or dissassembly which takes about five minutes for the wheel and one minute for the chair". Fetaures were "special design of yarn guide needs no threading at all"; the lazy kate had a "special lock" for plying; "simple system for protecting yarn from over-twisting or untwisting" by turning of the wheel whilst unattended. POLSON - see D P Polson and Hamish Polson. LEONARD WILLIAMS of The Forge, Whitchurch, Bristol. Maker of small upright spinning wheels with a solid drive wheel and some in a saxony style, possibly other styles as well (possibly working during 1970s-80s? more info needed). Reports say these wheels "spin fine". The upright wheel photographed below left has a small brass name plate set into the top surface of the front left corner of the table. Click here for more detail about Leonard Williams' spinning wheels including more photos. MARTIN REEVES see P&M WOOLCRAFT First made spinning wheels in the late 1970s when he adapted a design in The Woodworker magazine. Martin was working in the car industry at the time and used his engineering skills to redesign the wheel so that it worked well. This is the same set of plans that started James Williamson making wheels and is the basis of his "Lonsdale" wheel design. MICHAEL BRADLEY - Faringdon, Oxfordshire. Listed as a spinning wheel maker by Mabel Ross in her The Essentials of Yarn Design for Handspinners (1983). MILSON of Scotland, little known but the name and this photograph of a spinning wheel belonging ot an early member of the Christchruch, New Zealand, Guild of weavers spinners and dyers. It has a double (ie two) drive band (a single band in two loops is more common, but some Scottish and especially Orkney wheels, intended for spinning fine yarns, have two drive bands). MR D D MACLACHAN Lived near York, made a reproduction Irish Castle wheel pictured in Mabel Ross's Encyclopedia of Handspinning 1988. NEVILLE SMITH - took over from HARRY POUNCEY (see above) making spinning wheels to Harry's designs in the 1980s, up until 1991. He made the Penfillian wheel in the picture on p.83 of Mabel Ross's Encyclopedia of Handspinning (published in 1988). P&M WOOLCRAFT – SEE ALSO MARTIN REEVES - Martin has been making spinning wheels since late 1970s including three main designs, the MACDONALD – an upright spinning wheel, made in oak or yew, either single or double treadle; the PINDON - "Traditional spinning wheel with a flattish bed. "; the WESSON"In the classic saxony style. PETER ROYLE Peter Royle, of Leyland, Lancashire, made a saxony type spinning wheel called "THE COUNTESS". Mabel Ross’s Encyclopedia of Handspinning (1988) says on page 99: ”a versatile wheel with twist ratios up to 12:1, well-spaced draw-on ratios, an easily removable wheel for transport and alternative flyer assemblies for very fine and very thick yarns”. The drive wheel was described as 50cm diameter by an ebay seller. An advert in The Weavers Journal no. 128 Winter 1983 said: "Finest engineering, beautiful timber and traditional style make this a wheel to use and treasure. Acclaimed by leading spinners throughout the country." It is believed that he also made an upright wheel in Yew wood, which might have been called "Peacock". The wheel pictured below is a Countess, a plaque on the top surface of the table bears the maker's mark, name and phone number, the name of the person for whom it was commissioned, and the date of June 1992. PETER TEAL made more than one style of spinning wheel (as well as his famous wool combs), an advert in The Weavers Journal no. 88, Winter 1973, announced "to enable me to devote more time to the restoration of old and antique wheels, and to the making of special designs, I am discontinuing the production of my standard wheels". REDGATES Little known, small advert from private seller in The Weavers Journal no. 163 September 1992 said "Superb Redgates spinning wheel, oak, 8 bobbins, double-treadle for effortless spinning"
ROGER COLTMAN Of Hook Norton, Oxfordshire. Made an upright mahogany spinning wheel. ROGER SEARS I have quite a lot of information, more detail to follow, or see YarnMaker magazine edition no.14. Just one of Roger Sear's wheel designs, many are decorated with carved designs. SHAPWICK BLAISE HERRING WHEEL Probably the second makers of the bent plywood spinning wheel commissioned by Frank Herring & Sons of Dorchester, Dorset, see entry for FRANK HERRING AND SONS above. STARKEY - Mr Jon Starkey made the "Easy Spin" wheels, see above under EASY-SPIN. STEWART THOMPSON of Fair Isle, Shetland. Maker of Shetland spinning wheels. TED WHITE, based in North Wales, maker of great wheels. TIMBER TOPS TABLE CO SEE 'TIMBERTOPS', this is an earlier name used by the same makers, James and Anne Williamson of Ashfordby, Leciestershire, England. TIMBERTOPS - made by James and Anne Williamson of Ashfordby, Leciestershire, England. Their wheels were made in used Oak (natural or fumed finish) and Yew woods from 1975 to 2008 (business sold & after 2009 Timbertops wheels made in smaller range but wider variety of woods by Woodland Turnery). The Williamsons started out making wooden items for the home including small tables, hence the original name of Timber Tops Table Co. Around 80-90% of the Timbertops wheels were exported either direct to individuals or for sale through dealers. Models include: BEAVER double treadle spinning wheel with two drive wheels to accelerate the flyer, ratios 1:10 to 1:25; CHAIR WHEEL based on American chair wheels of 1700s mainly from Conneticut. Double treadle with two drive wheels to accelerate the flyer and maidens on either side of the wheel enabling the flyer to be used on either side. ratios from 1:10 to 1:30. 34" tall; GREAT WHEEL three legs to the table, 40" diameter drive wheel, spindle 9" x 3/8", some had an accelerating head increasing the standard ratio of 1:50 to 1:150; IRISH CASTLE WHEEL based on the traditional "Ulster Wheel" with either an 18" or 21" drive wheel above the flyer, height 50", single treadle; LEICESTER made in yew and oak, compact flat bed Scandinavian type wheel, four legs, single or double treadle, built in lazy kate, 24" drive wheel, standard flyer whorl gives ratios 1:8 and 1:10 but other smaller and larger whorls were made. Flyer may be either to right or left side of the drive wheel. Standard flyer has orifice size 3/8". Some early wheels have a horseshoe shaped flyer, later ones had a U shaped flyer made in seven parts for strength; LONSDALE upright wheel with 18" drive wheel and flyer set to one side. Built in lazy kate. Standard ratios 1:8 and 1:10. This wheel is one developed from a design originally published in The Woodworker magazine in the 1970s, Martin Reeves also adapted this design and produced the MacDonald, and there are many similar wheels made from the plans in The Woodworker by other makers which look similar but do not necessarily have the improvements which turned what was an ornamental desgin into a good working spinning wheel. If you find a wheel like this look for either the Timbertops name or James Williamson's signature to confirm that it is a Lonsdale and not by another maker; MOWBRAY more ornate than the Thurmaston with a 21" 12 spoke wheel with extra short stub spokes in between. Standard ratios 1:9 and 1:11, alternatives from 1:6 to 1:14; SHERWOOD 31" drive wheel with double treadle based on the large Canadian wheels called "CPW" or Canadian Production Wheel because of their speed; THURMASTON ( drive wheel sizes 19", 21" 24") sloping bed spinning wheel, standard flyer whorl gives ratios 1:8 and 1:10 but other smaller and larger whorls were made; SUITCASE a wheel based on the smallest Thurmaston with screw in legs that could be removed for travel. James Williamson has also made small upright "parlour" type spinning wheels. Below, left to right, Lonsdale, Leicester, Mowbray, Sherwood, Thurmaston (19"). TIM WOOD, CARDIFF. A spinning wheel advertised on Ebay UK in July 2016 looking similar to Scandinavian wheels with a large diamater drive wheel, steeply sloping table, tall thin maidens, had this description Oak spinning wheel made by Tim Wood, Cardiff, # 10. Beautiful joinery. Wheel is 24 inch diameter...Originally 400 gbp. In response to a query the seller also said that there were four grooves on the flyer whorl, ranging from approx 6.5cm to 4cm diameter. If you know anything about this maker and his spinning wheels, and especially if you can provide photographs, please get in touch. Probably the same maker as the T M WOOD Of Barry, South Glamorgan, Wales. Advertised in The Weavers Journal no. 163. September 1992 Traditional sloping-bed Spinning Wheels, hand-made from seasoned British oak or ash. 24" Wheel. Ratios available to your specification. TONY DEVONALD maker of a double=drive saxony type spinning wheel sold through Spindles of Canterbury. This wheel is unusual in that the flyer and bobbin are supported by a single maiden behind the flyer whorl and the flyer arms are removable for access to the bobbin. TWO RIVERS STUDIO of Longnor, Staffordshire in the Peak District. Around four or five models of spinning wheel made in the late 1980s. Models included: DOVE, a small upright spinning wheel, made of oak, and MANIFOLD a sloping bed spinning wheel. Picture left shows the Two Rivers Studio spinning wheel Manifold, right shows the Dove. VICTOR EDWARDS HAWKHURST Made spinning wheels and looms, advertised in The Weavers Journal, winter 1976. Had previously worked for the Harris Loom company. WESTBURY Based on an traditional Cotswold design (according to Mabel Ross in her Encyclopedia of Handspinning, 1988) they were originally made by Elton Crafts of Westbury, Wiltshire, then from the early 1980s by The Splinter Group of The Old Brewery, The Close, Warminster, and according to Mabel Ross, from 1984 by Mr D C Reeves of Somerset. Various different woods were used. The Westbury has a weighted drive wheel and a treadle that pivots with heel behind the treadle bar so that it is possible to treadle by rocking the foot, pushing with both heel and toe. They are designed to be use either in double-drive (see here for how to fit a double-drive band) or single drive with the drive wheel driving the flyer and a scotch tension brake on the bobbin. The flyer has a 1/12" orifice and the lazy kate consists of three wooden posts either situated on the flyer end of the table or on the table in front of the drive wheel. These wheels remain popular, liked for being compact and easily carried, because they spin well, and have been described as a "little workhorse". Left: a Westbury spinning wheel. WILLIAM GORDON CLARKE / WILLIAM GORDON / GORDON CLARKE Saxony wheel with 26" drive wheel (one sold on ebay was described as 25.5" so they may vary). William Gordon Clarke's workshop was initially in Hay on Wye, he later moved to Marazion, Penzance, Cornwall, which was given as his address in 1983 by Mabel Ross in her Essentials of Yarn Design. Maker's description from his leaflet about the spinning wheel pictured below: "The design is based on an old style working wheel with modern fittings on the main moving parts. Whilst not intended to be a reproduction piece it has an initial mellow appearance of a well used wheel and has been described as one of tomorrow's heirlooms. Each wheel is handbuilt with its number, the date and the maker's name cut in the underside of the stock." Various woods were used for making these wheels, mine is made in Elm, no. 19, made in May 1981. Left: by William Gordon Clarke. WILLIAM HALL Winchcombe Pottery, Winchcombe, Gloucestershire. 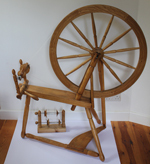 Made a Scandinavian type spinning wheel with a 24" drive wheel which he advertised in The Weavers Journal, no. 100, Winter 1976. The photo shows a"double-table" type wheel in the style sometimes called "Norwegian" and the main table has sides that curve inwards, the wheel spokes are straight without turning or tapering, there are three legs. WILLIE PETRIE - Orkney wheel maker, lived in Orkney, Scotland, and made wheels in the style traditional in those islands. Orkney wheels have dumbell shaped spokes, a treadle chamfered on the front edge, and a drive wheel with two grooves to take two separate drive bands, one to drive the bobbin and one to drive the flyer. His wheels are signed with a name stamp. Mystery Wheels - can you help with identification? This wheel was bought in 1980 from The Village Craft Shop in Forest Row, Sussex, England. The style is similar to Finnish wheels, however it is believed to be made in England. Click here to see enlarged image. This is a type of flax wheel that turns up around the North Yorkshire/ Cumbria border and seems to be a design/maker local to that area. It is said that the huge space under the drive wheel - not seen on other spinning wheels - is for a trough of water to keep the flax damp whilst spinning. Someone who has owned one commented: "It’s a double drive, clearly designed for spinning fine yarns, so with quite high ratio - whoever was [spinning] would need to be able to draft at a reasonable rate." If you know more about this type of spinning wheel, please get in touch. Website copyright 2013-2018 Dorothy Lumb. Contact me via the YarnMaker website.